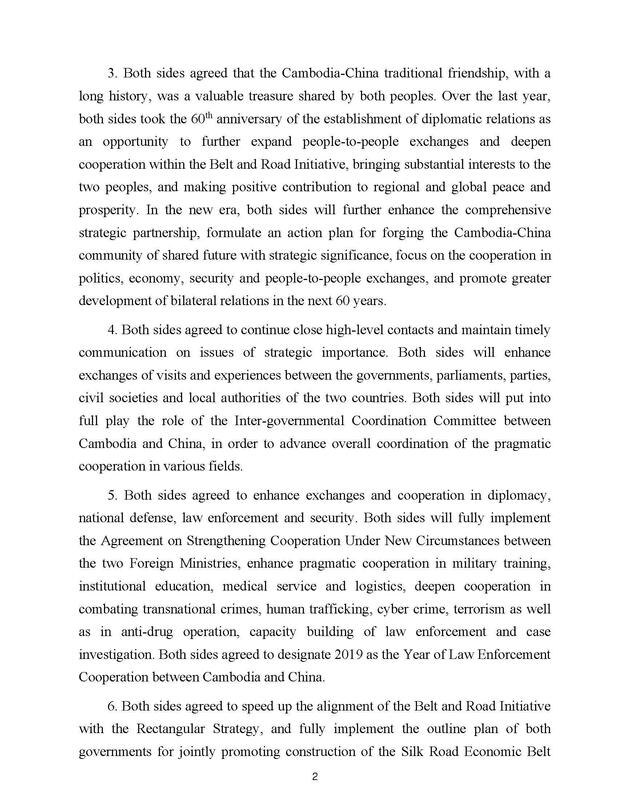 Phnom Penh (FN), Jan. 23 – Cambodia and China agreed to speed up the alignment of the Belt and Road Initiative with the Rectangular Strategy, and fully implement the outline plan of both governments for jointly promoting construction of the Silk Road Economic Belt and the 21st Century Maritime Silk Road, both sides wrote in a Joint Communique following Prime Minister Hun Sen’s three-day Official Visit to China. 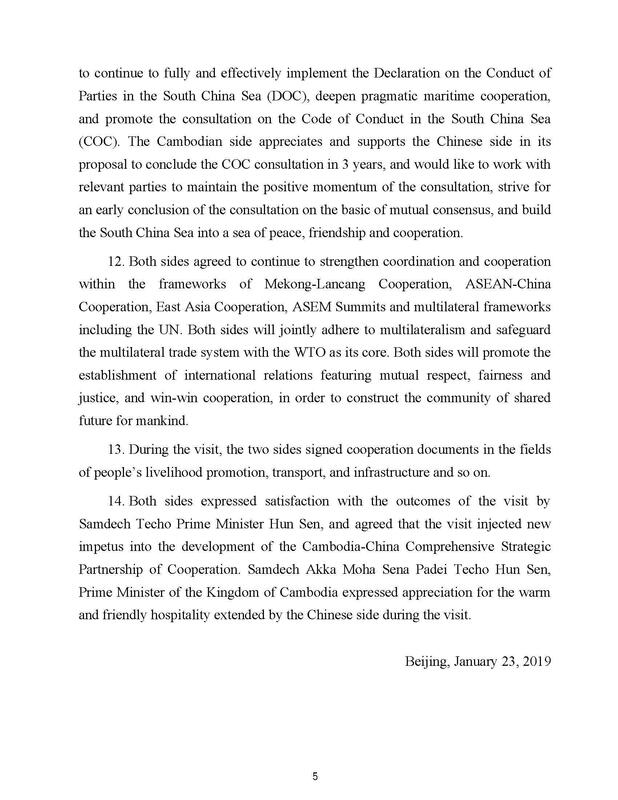 Both sides agreed to enhance pragmatic cooperation within the framework of the Belt and Road Initiative, with focus on transportation, production capacity, energy, trade, and people’s livelihoods; and comprehensively enhance and promote cooperation in trade, investment, infrastructure, etc, and elevate the scale and level of bilateral trade. 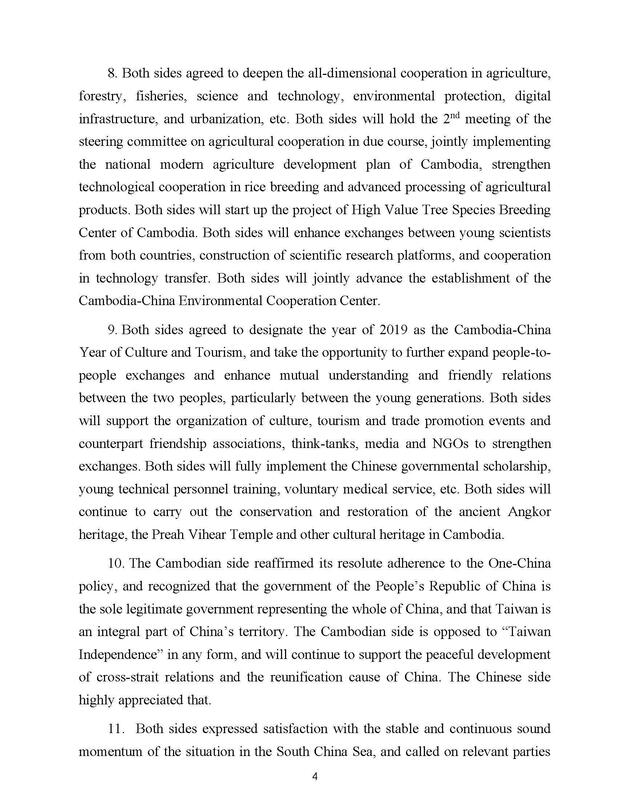 Both sides will enhance cooperation on platforms such as the China International Import Expo, China-ASEAN Expo, etc. 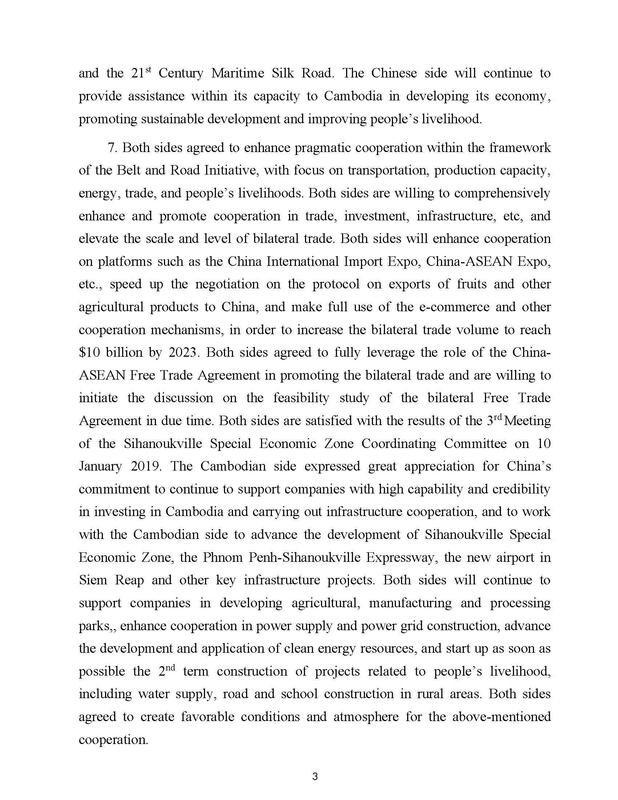 ; speed up the negotiation on the protocol on exports of fruits and other agricultural products to China; and make full use of the e-commerce and other cooperation mechanisms, in order to increase the bilateral trade volume to reach $10 billion by 2023. 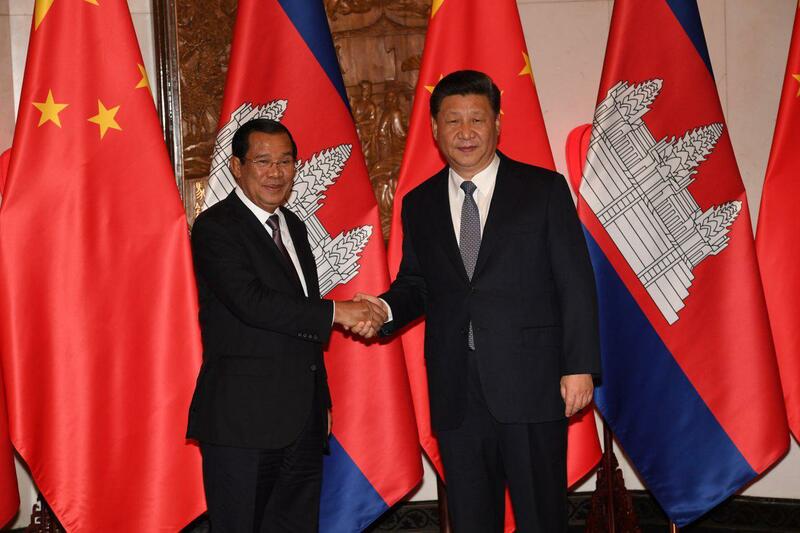 Cambodia and China agreed to fully leverage the role of the China-ASEAN Free Trade Agreement in promoting the bilateral trade and are willing to initiate the discussion on the feasibility study of the bilateral Free Trade Agreement in due time. 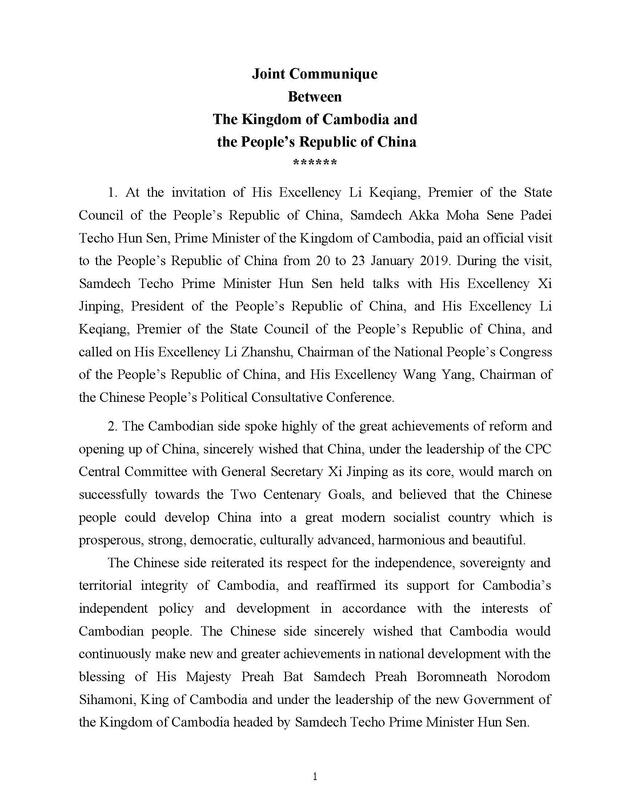 The Cambodian side expressed great appreciation for China’s commitment to continue to support companies with high capability and credibility in investing in Cambodia and carrying out infrastructure cooperation, and to work with the Cambodian side to advance the development of Sihanoukville Special Economic Zone, the Phnom Penh-Sihanoukville Expressway, the new airport in Siem Reap and other key infrastructure projects. 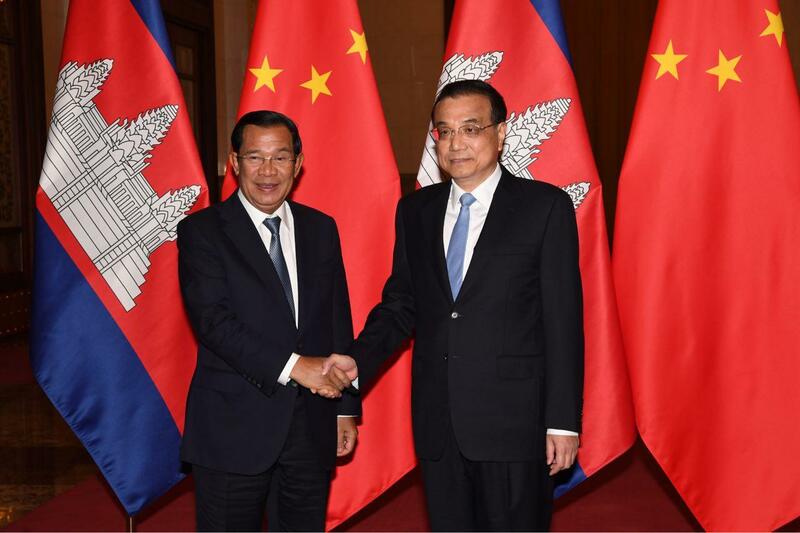 Prime Minister Hun Sen concluded the fruitful mission and landed in Cambodia safe on Wednesday.